There are soft tacos and there are crisp tacos. Mostly in Mexico you will find that tacos there are the soft kind. The crisp tacos seemed to have originated with the proliferation of taco stands during the late fifties. That basic 1950’s taco has defined the American conception of the dish. It is a crisp-fried corn tortilla in a U-shape. It is filled with layers of “taco-seasoned” ground meat, sliced lettuce, diced tomatoes and grated cheese (usually cheddar). 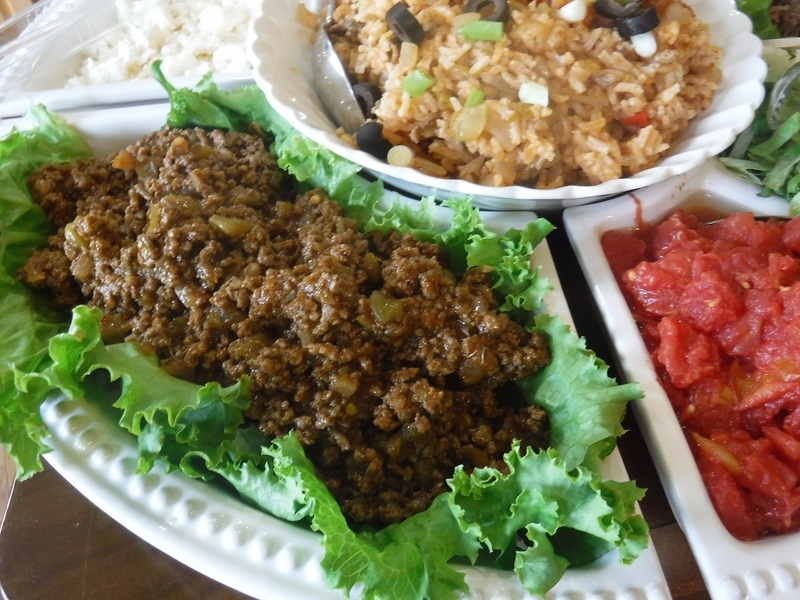 This version of the dish will feature shredded taco meat. If you desire, you can substitute 1 ½ pounds of lean ground beef instead of the shredded beef. Instructions are given for fried, crisp shells. Warmed tortillas fold easier and don’t crack as often. The choice of taco shell, whether crisp fried corn tortilla, soft corn tortilla or soft wheat flour tortilla, is entirely yours. There are packaged spice mixes for tacos that give good results if you prefer to use them. Wash jalapeño chili. Remove stem end. Most of the heat in the chili is in the white membrane and the associated seeds. Remove the seeds and membrane according to the chili pungency you wish. Mince fine. Place shredded beef in a large frying pan with a bit of oil. If using ground beef, sauté ground meat until no longer pink. Keep breaking up the meat so that you have a fine grained meat mixture. Drain grease, leaving the meat in the pan. Add onion, jalapeño and Anaheim chilies and cook until onion is soft and transparent. Add tomato sauce, bouillon cube, pepper and chili powder. Simmer, stirring frequently, until mixture has thickened and slightly pasty. Remove from heat and set aside. For soft tacos, loosely wrap tortillas in a slightly damp kitchen towel. Heat in a 250 oven for 15 minutes or until warmed through. For crisp tacos, heat 1-inch of oil in a medium frying pan until the oil shimmering. Take tortilla and bring two opposite edges together and make a taco shape. Holding with te fingers, lower the middle section, the curved part, into the hot oil. In a few seconds that part of the tortilla will become slightly stiff. Using tongs, lower one side of the folded tortilla into the oil and fry until crisp. Hold the other side of the tortilla with the tongs to hold the taco shape. When the one side of the tortilla is crisp, turn and finish cooking the other side. You need to cook the taco shells until they are crisp. If you undercook them, they will be as tough-as-leather. Remove to paper towels to drain. Dice tomatoes and drain away liquid and seeds. Place in convenient bowl. Thin slice lettuce and shred. Place in convenient bowl. 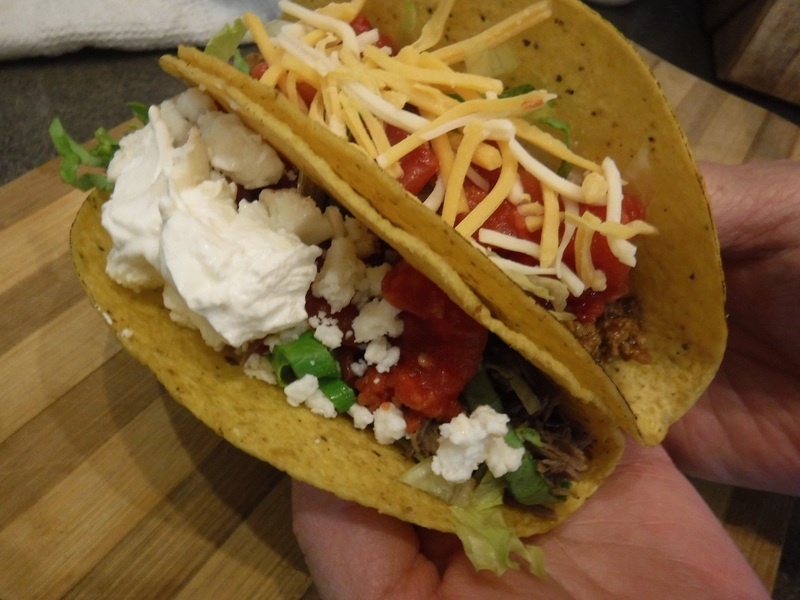 Take prepared taco shell. 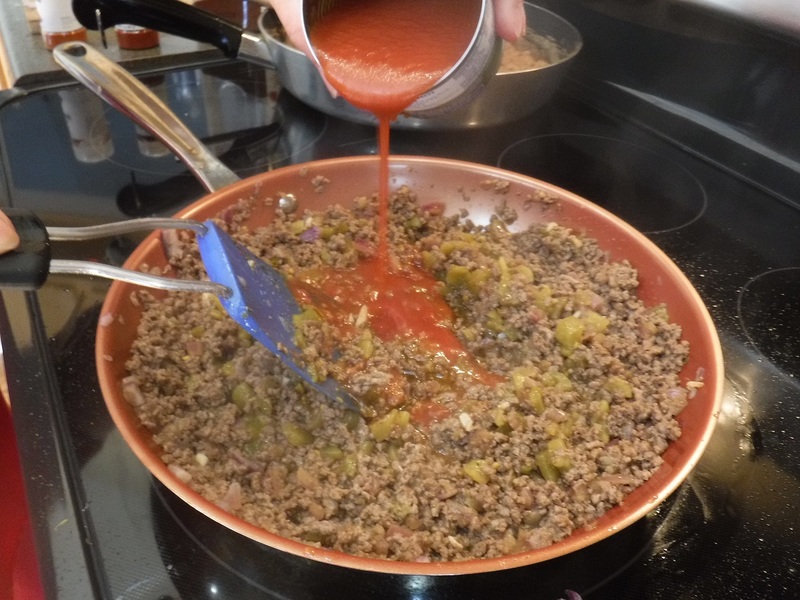 Place ¼ cup of the meat mixture in the bottom of the shell. Add a layer of the lettuce, a layer of diced tomatoes and top with the shredded cheddar cheese. That completes the classic 1950’s taco stand taco. A bottle of Tabasco® hot sauce will stand in for the little bags of hot tacos sauce that were offered at the taco stands. It doesn't hurt to add a nice dollop of sour cream either. Additional filling items, to personal taste, can include such things as chopped onions, cilantro, salsa, guacamole or avocado slices. As given, the recipe makes a nice mildly spicy taco filling. You can add more jalapeño peppers, or more chili powder if you want the whole dish to be hotter. If just some of the people want the dish hotter, serve with a bottle of hot sauce on the side. The original fifties tacos were mildly spicy. Just about everyone asked for the little containers of the hot sauce on the side.